Crazed cuckservative Paul Ryan is threatening to sue Trump if upon becoming president he dares to put a temporary halt on the mass importation of Muslims. 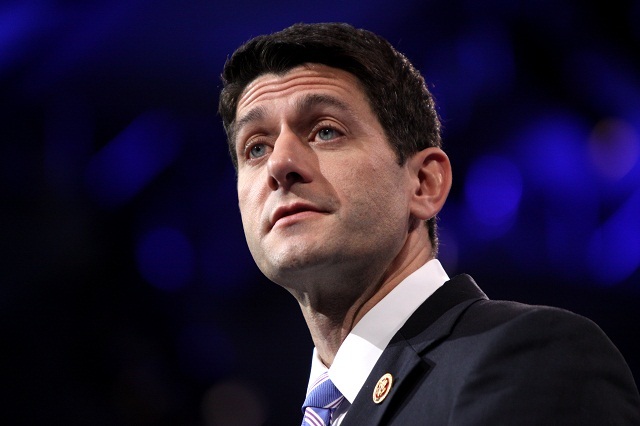 In a sit-down interview in his ceremonial Capitol Hill office on Thursday, Ryan told The Huffington Post that Trump does not have "a blank check" with his endorsement… On the topic of Trump's proposed Muslim ban and his statements that he could enact such a policy without Congress, Ryan noted that Republicans were releasing part of their agenda on executive overreach that very day, and, in news that's sure to please Trump, Ryan suggested that he and the House of Representatives were prepared to sue a Republican president if need be. "I would sue any president that exceeds his or her powers," Ryan said. It's unclear, however, if Ryan thinks Trump enacting a ban on Muslims entering the country would actually exceed presidential powers. "That's a legal question that there's a good debate about," Ryan said, pointing to the 1952 Immigration and Nationality Act. As the Daily Caller's Alex Pfeiffer has reported, all of the past six presidents have used the authority this statute provides to block certain classes of immigrants from entering the country. Temple University Law Professor Jan Ting told the Daily Caller that existing law "absolutely and without any doubt" would allow a President Trump to restrict immigration of certain nationalities or religious groups. Every day there is another Muslim crazy person taking hostages, threatening to murder people for not converting and shooting up gay bars. There's been so many stories in just the last week I couldn't even cover them all, meanwhile the media and Paul Ryan are freaking out over Trump saying we should temporarily halt their mass importation.